We love our community and staying connected! So we have decided to make a game out of it. There are so many things happening in Elk Grove this summer, from concerts in the park to food truck mania to fun runs. While you are out and about at these fantastic events, so are we. Be on the lookout for Coach Abby while you are there. 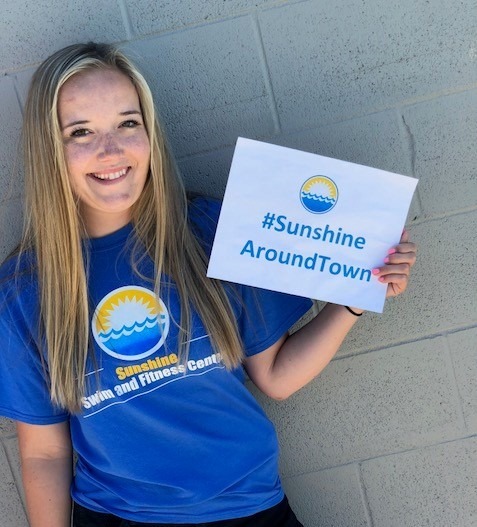 If you find her, stop, take a picture with her and post it on your facebook page, tagging the Sunshine Swim and Fitness Center, with the #SunshineAroundTown. Of course, because it is a game, there are prizes! Each week there will be a drawing. One name will be chosen from all who participate that week, for a $50.00 gift certificate to use towards any Sunshine Swim and Fitness Center programs. You might be wondering where Coach Abby will be next. Follow the Sunshine Swim and Fitness Center on Facebook to find out. Let’s have some fun!